The BMW M88 is a straight-6 DOHC petrol engine which was produced from 1978-1989. It is based on the DOHC version of the BMW M49 engine, which was used in the BMW 3.0CSi racing cars. The M88 was produced alongside the BMW M30 engine, as the higher performance engine. In North America up until 1989, the BMW S38 engine was used instead of the M88. In 1989, an updated version of the S38 became the worldwide replacement for the M88. The M90 is a SOHC engine which is based on the M88/1. 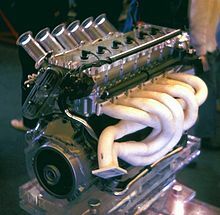 BMW engineers used DOHC valvetrain on a production engine for the first time on the M88, with the camshafts driven by a single-row timing chain. Kugelfischer fuel injection was used with individual throttle valves and the distinctive six individual throttle bodies. The construction is an aluminium cylinder head and a cast iron block. The bore is 93.4 mm (3.68 in) and the stroke is 84.0 mm (3.31 in), resulting in a displacement of 3,453 cc (210.7 cu in). The M88/1 was the first iteration of the M88 and was fitted to the BMW M1. It produced 204 kW (274 hp) at 6,500 rpm and 330 N⋅m (243 lbf⋅ft) at 5,500 rpm. A dry sump is used. For Group 5 racing, the M88 engine was turbocharged and became known as the M88/2. This race engine produced up to 670 kW (900 hp). M88/3 iteration used in the E24 M635CSi and E28 M5. The M88/1 engine was modified for use in the E24 M635CSi and E28 M5 and was known as the M88/3. The Kugelfischer fuel injection was replaced with Bosch Motronic producing 213 kW (286 hp) at 6,500 rpm and 340 N⋅m (251 lbf⋅ft) at 4,500 rpm. It has a compression ratio of 10.5:1. The M88/3 was also fitted to the South African BMW 745i, due to packaging problems with the turbocharged M102 engine which was used in other markets. The M90 engine is a lower performance SOHC engine that was based on the M88/1. It utilizes the same block from the M88 and maintains the same bore and stroke, but borrows its head from the BMW M30 engine family. Different years of M90 engines used both Bosch Motronic and Bosch L-Jetronic engine management systems. Typically identified by a white L painted on the block behind the oil filter housing and coolant water passages on the side of the block. The M90 sold in Europe and most other markets (except North America) used a compression ratio of 9.3:1, did not have a catalytic converter and produced 160 kW (215 hp). ^ "The Story of 40 Years BMW M ‒ The BMW M1". www.gtspirit.com. Retrieved 13 December 2018. 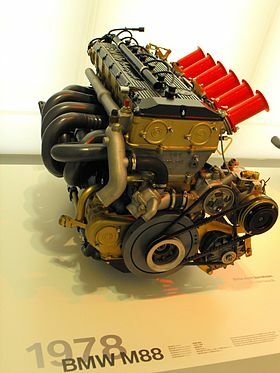 ^ "Top 5 Great BMW Engines - mydriftfun.com". www.mydriftfun.com. 11 May 2017. Retrieved 13 December 2018. ^ "1984 BMW 745i E23 5-Speed manual M88 engined SA model road test". www.drive-my.com. Retrieved 2 December 2018. ^ "BMW M88 and S38 M-Tech 24 Valve Six Cylinder Engines". www.unixnerd.demon.co.uk. Retrieved 2 December 2018. ^ "The BMW Six Cylinder Guide". www.autospeed.com. This page was last edited on 30 March 2019, at 12:38 (UTC).